Renaissance Venetian society recognized two different classes of courtesans: the cortigiana onesta, the intellectual courtesan, and the cortigiana di lume, lower-class prostitutes who tended to live and practise their trade near the Rialto Bridge. 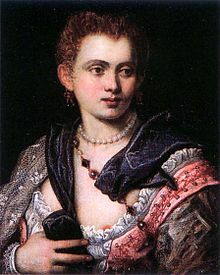 Veronica Franco was perhaps the most celebrated member of the former category, although she was hardly the only onesta in 16th-century Venice who could boast of a fine education and considerable literary and artistic accomplishments. The daughter of another cortigiana onesta, Franco learned the art at a young age from her mother and was trained to use her natural assets and abilities to achieve a financially beneficial marriage. While still in her teens, Franco married a wealthy physician, but the union ended badly. In order to support herself, Franco turned to serving as a cortigiana to wealthy men. She quickly rose through the ranks to consort with some of the leading notables of her day and even had a brief liaison with Henry III, King of France. Franco was listed as one of the foremost courtesans of Venice in the Catalogo de tutte le principal et più honorate cortigiane di Venetia (published about 1565). A well-educated woman, Veronica Franco wrote two volumes of poetry: Terze rime in 1575 and Lettere familiari a diversi in 1580. She published books of letters and collected the works of other leading writers into anthologies. Successful in her two lines of work, Franco also founded a charity for courtesans and their children. In 1575, during the epidemic of plague that ravaged the city, Veronica Franco was forced to leave Venice and lost much of her wealth when her house and possessions were looted. On her return in 1577, she defended herself with dignity before the Inquisition on charges of witchcraft (a common complaint lodged against courtesans in those days). The charges were dropped. There is evidence that her connections among the Venetian nobility helped in her acquittal. Her later life is largely obscure, though surviving records suggest that although she won her freedom, she lost all of her material goods and wealth. Eventually, her last major benefactor died and left her with no financial support. Although her fate is largely uncertain, she is believed to have died in relative poverty. When we too are armed and trained, we can convince men that we have hands, feet, and a heart like yours; and although we may be delicate and soft, some men who are delicate are also strong; and others, coarse and harsh, are cowards. Women have not yet realized this, for if they should decide to do so, they would be able to fight you until death; and to prove that I speak the truth, amongst so many women, I will be the first to act, setting an example for them to follow. In 1565, when she was about 20 years old, Veronica Franco was listed in the Catalogo de tutte le principal et più honorate cortigiane di Venetia, which gave the names, addresses, and fees of Venice's most prominent prostitutes; her mother was listed as the person to whom the fee should be paid. From extant records, we know that, by the time she was 18, Franco had been briefly married and had given birth to her first child; she would eventually have six children, three of whom died in infancy. As one of the più honorate cortigiane in a wealthy and cosmopolitan city, Franco lived well for much of her working life, but without the automatic protection accorded to "respectable" women, she had to make her own way. She studied and sought patrons among the learned. By the 1570s, she belonged to one of the more prestigious literary circles in the city, participating in discussions and contributing to and editing anthologies of poetry. In 1575, Franco's first volume of poetry was published, her Terze rime, containing 18 capitoli (verse epistles) by her and 7 by men writing in her praise. That same year saw an outbreak of plague in Venice, one that lasted two years and caused Franco to leave the city and to lose many of her possessions. In 1577, she unsuccessfully proposed to the city council that it should establish a home for poor women, of which she would become the administrator. By then, she was raising not only her own children but also her nephews, who had been orphaned by the plague. In 1580, Franco published her Lettere familiari a diversi ("Familiar Letters to Various People") which included 50 letters, as well as two sonnets addressed to King Henry III of France, who had visited her six years earlier. We have little information for her life after 1580. Records suggest that she was less prosperous in her later years, but was not living in poverty. However, she published no more writings. Franco's life was recorded in the 1992 book The Honest Courtesan, by author Margaret F. Rosenthal. Catherine McCormack portrayed Veronica Franco in the 1998 movie Dangerous Beauty (released as A Destiny of Her Own in some countries), based on Rosenthal's book. She is also portrayed in the 2012 novel named after her (Serbian: Штампар и Вероника) authored by Serbian writer Katarina Brajović. A sample of poems and letters by Veronica Franco may be found here. A number of portraits, attributed to Tintoretto, may be found here these are all thought to portray Franco. A more extensive discussion of the film may be found here. Adler, Sara Maria. "Veronica Franco's Petrarchan Terze rime: Subverting the Master's Plan," Italica 65: 3 (1988): 213-33. Diberti-Leigh, Marcella. Veronica Franco: Donna, poetessa e cortigiana del Rinascimento. Ivrea, Italy, 1988. Jones, Ann R. The Currency of Eros: Women's Love Lyric in Europe, 1540-1620. Bloomington and Indianapolis, Ind., 1990. Phillipy, Patricia. "'Altera Dido': The Model of Ovid's Heroides in the Poems of Gaspara Stampa and Veronica Franco," Italica 69 (1992): 1-18. Rosenthal, Margaret F. The Honest Courtesan: Veronica Franco, Citizen and Writer in Sixteenth-Century Venice. Chicago,1992. More info here. ^ Margaret F. Rosenthal discusses this distinction in her article, see below. ^ "Veronica Franco". www.jazzbabies.com. Retrieved 29 November 2018. ^ "Život za knjigu u lepoj Veneciji" (Press release). Politika. November 28, 2012. Retrieved February 21, 2013. Pesnikinja Veronika Franko zaista je postojala, njeno delo se i danas smatra interesantnim, a pisala je rime o svojim ljubavnicima. Njenoj biografiji dodala sam detalje koji su bili važni u kreiranju dramske strukture romana. Wikimedia Commons has media related to Veronica Franco. This page was last edited on 2 December 2018, at 09:00 (UTC).